Religiously active Americans are more trusting of others, and they are more involved in groups and in their communities – they also feel better about their locales. Some 40% of Americans say they are active in a church, religious, or spiritual organization. Compared with those who are not involved with such organizations, religiously active Americans are more trusting of others, are more optimistic about their impact on their community, think more highly of their community, are more involved in more organizations of all kinds, and devote more time to the groups to which they are active. A survey by the Pew Research Center’s Internet & American Life Project asked people about their membership in 28 different kinds of organizations and clubs. Religious and spiritual organizations topped the list, and those who were active in such groups were more active in all kinds of groups. The average number of groups that religiously active Americans are active in is 5.61, and those who are not involved with religious groups participate in 2.11 groups. Those who are active in religious groups spend an average of 7.5 hours per week in group activities compared with 5.4 hours for those not active in a religious group. With regard to technology, religiously active Americans use the internet, email, broadband, cell phones and social media platforms at similar rates to other Americans. 49% of the religiously active view the internet as having a major impact and 34% having a minor impact on the ability to keep up with news and information from the groups in which they are active (compared with 59% and 25% for the non-religious). 38% of the religiously active view the internet as having a major impact and 37% having a minor impact on the ability to organize group activities for their groups (compared with 46% and 28% for the non-religious). 34% of the religiously active view the internet as having a major impact and 38% having a minor impact on the ability to find interesting groups to join (compared with 42% and 28% for the non-religious). 22% of the religiously active view the internet as having a major impact and 43% having a minor impact on the ability to volunteer their time to groups in which they are active (compared with 27% and 37% for the non-religious). 20% of the religiously active view the internet as having a major impact and 38% having a minor impact on the ability to contribute money to groups (compared with 28% and 31% for the non-religious). 68% of Americans who are active in religious groups (internet users and non-users alike) said the internet has had a major impact on the ability of groups to communicate with members. 62% of Americans who are active in religious groups said the internet has had a major impact on the ability of groups to draw attention to an issue. 57% of Americans who are active in religious groups said the internet has had a major impact on the ability of groups to connect with other groups. 58% of Americans who are active in religious groups said the internet has had a major impact on the ability of groups to impact society at large. 57% of Americans who are active in religious groups said the internet has had a major impact on the ability of groups to organize activities. 46% of Americans who are active in religious groups said the internet has had a major impact on the ability of groups to raise money. 44% of Americans who are active in religious groups said the internet has had a major impact on the ability of groups to recruit new members. 46% of Americans who are active in religious groups said the internet has had a major impact on the ability of groups to impact local communities. 30% of Americans who are active in religious groups said the internet has had a major impact on the ability of groups to find people to take leadership roles. That report notes that religious and spiritual organizations are by far the most popular groups among Americans, with 40% of American adults stating they are active in such groups. This is considerably higher than the next most popular organizational types, which are sports and recreation leagues (in which 24% of adults are active) and far outpaces other kinds of groups. 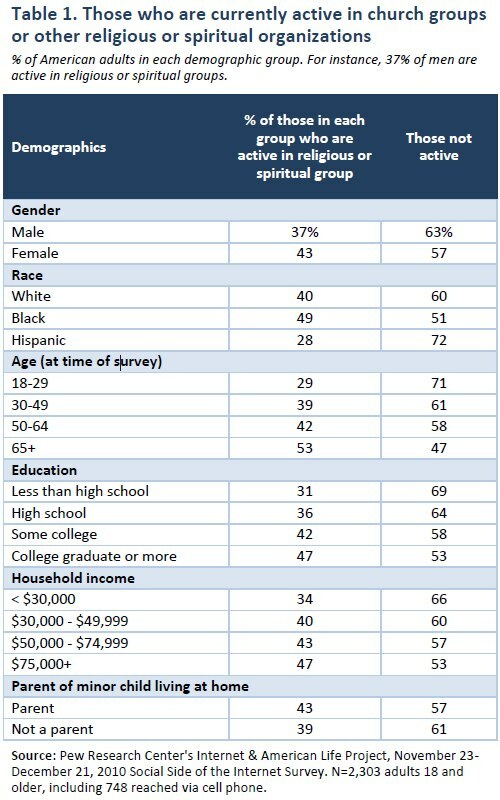 That makes religiously active Americans a particularly interesting group to explore. Given that religious groups drew by far the most members, we decided to explore more deeply the characteristics of those Americans active in religious organizations and spiritual groups, including their technology profile. We were especially interested in these findings because there is a significant debate about the role of religious believers in public life. Some commentators have pointed to an increased polarization in America between religious conservatives and secular liberals at the edges of partisan divides, with a dwindling grouping of religious moderates in the middle.4 There are also concerns about how this might affect community cohesion and whether religious believers are so focused on their beliefs and spiritual lives that they might not have the inclination or energy to participate in other parts of community life. We wanted to shed some insights on these concerns. It is important to note at the outset that this survey was conducted to take a broad reading on group activity in America and on the potential impact that technology has on group activities of all kinds – mainly secular. We were anxious to know about how those in religious groups act in their communities, but we did not probe in depth for people’s religious affiliations. Thus, we cannot produce findings comparing those connected to different faiths – for instance, how evangelical Protestants are similar to or different from Roman Catholics. We do look at the differences between those who are active in religious groups and those who aren’t; and we look at those who are serious practitioners of their faiths compared with those who are less-frequent church goers. The results in this report are based on data from telephone interviews conducted by Princeton Survey Research Associates International among a sample of 2,303 adults, age 18 and older. Telephone interviews were conducted in English and Spanish by landline (1,555) and cell phone (748, including 310 without a landline phone). For results based on the total sample, one can say with 95% confidence that the error attributable to sampling is plus or minus 2.3 percentage points. For results based on internet users (n=1,811), the margin of sampling error is plus or minus 2.6 percentage points. In addition to sampling error, question wording and practical difficulties in conducting telephone surveys may introduce some error or bias into the findings of opinion polls. Who is active in religious groups? In the survey, we asked if respondents were active in a religious or spiritual organization. We inquired about a variety of demographic information. We also queried for a variety of viewpoints on other people, organizational impact, and communities. We then asked respondents a series of questions on their use of and view of technology. From Table 1, we see that women (43%) are more likely than men (37%) to be active in church groups. In fact, 55% of those in religious or spiritual groups are women, and 45% are men. African-Americans (49%) are the most likely to be active in church groups, much more than their white (40%) or Hispanic (28%) counterparts. However, most of those active in religious or spiritual groups are white (70%), with 14% being black, 9% Hispanic, and 7% other. Older Americans are the most likely to be active in church groups, with a positive correlation between age and involvement in these religious and spiritual groups. Participation in religious or spiritual groups is highest among adults with a college education (47%) and those with the highest incomes (47% of those with household incomes of $75,000+). Finally, parents (43%) are more likely than non-parents (39%) to be involved in a religious or spiritual group. However, perhaps counter to commonly held expectations, the difference is not statistically significant. We examined where the people active in a religious or spiritual organization live. 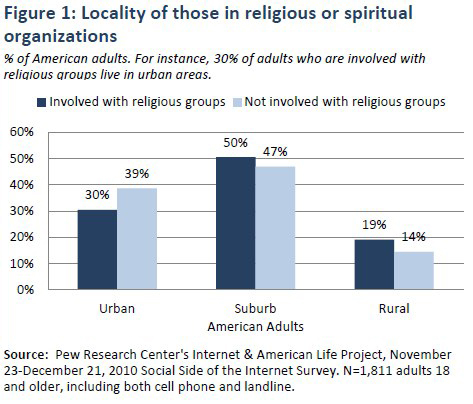 As we noted in our earlier report, The Social Side of the Internet, those who live in rural areas (49%) were more likely than others to be involved with church and spiritual groups. However, when we look at the distribution based on involvement in these organizations, we see that at an absolute level, suburbanites outnumber urban and rural areas in religious or spiritual organizations. We also examined the length of time a person lived in a particular location, as shown in Figure 2. 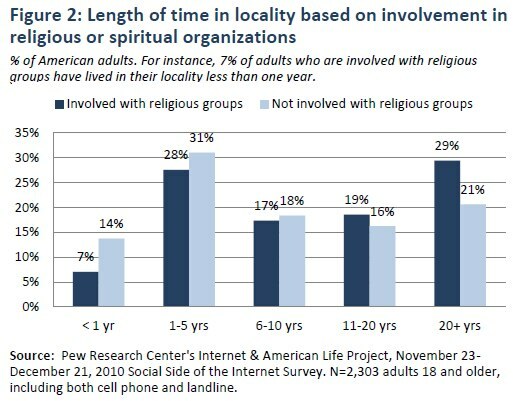 From Figure 2, we see that there is little difference among each of our categories between those active in religious or spiritual organizations and those not when a person has been in a locality from 1 to 19 years. However, those active in religious or spiritual organizations are more likely to have lived in a community for 20 years or more, while those who have lived in a community for less than a year are less likely to be active in religious or spiritual organizations. 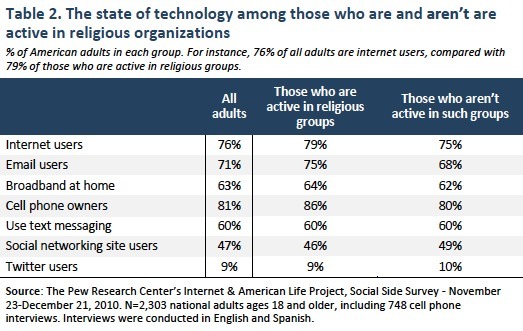 Those who are active in religious groups are just as engaged with many major technologies as those who are not active in religious groups, as shown in Table 2. From Table 2, for all American adults (not just internet or cell phone users), we see for members of religious groups, 79% are internet users, 75% are email users, , 64% have broadband at home, 86% are cell phone users, and 60% have used text messaging on their phone. In the social area, 9% of those in religious groups have used Twitter and 46% are users of a social networking site, such as Facebook.